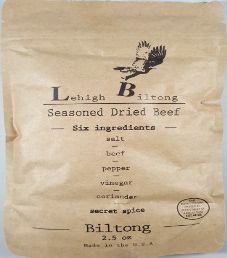 The next review for Lehigh Biltong will be on a 2.5 ounce/71 gram bag of their secret spice flavored beef biltong. This flavor is advertised to only include six ingredients, which includes a secret spice (salt, beef, pepper, vinegar, coriander, secret spice). This bag was graciously submitted for review by the owner Dan Levy. 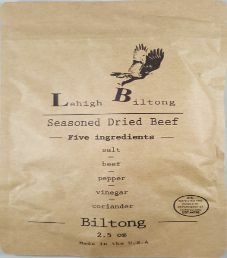 The first review for Lehigh Biltong will be on a 2.5 ounce/71 gram bag of their traditional flavored beef biltong. This flavor is advertised to only include five ingredients (salt, beef, pepper, vinegar, coriander). This bag was kindly submitted for review by the owner Dan Levy.